What does Coumadin do in the body? Absorption: Coumadin (warfarin) is rapidly absorbed after oral administration with considerable interindividual variations as well. Distribution: Coumadin (warfarin) distribution is 0.14 L/kg. Warfarin bound to plasma albumin approximately 99%. Metabolism: Warfarin exists as a racemic mixture of two active enantiomers which are present in R– and S– forms. Each of this forms is cleared by different pathways. S-isomer is 2-5 times more potent than the R-isomer in producing an anticoagulant response. Both isomer forms undergo Cytochrome P mediated metabolism by many different Cytochromes P isoenzymes to form 3′,4′,6,7,8 and 10-hydroxy warfarin metabolites. Major metabolite are 7-hydroxy warfarin formed from s-warfarin by CYP2C9 and 10-hydroxy warfarin formed from R-warfarin by CYP3A. Elimination: The elimination of warfarin is almost completely by metabolism. Very little amount of warfarin is excreted unchanged by urine. The metabolites are principally excreted into the urine; and to a lesser extent into the bile. Flagyl is a Brand name for a drug containing metronidazole as an active ingredient. It is used as an antibiotic and antiprotozoal medicine. It can be used alone or in combination with other antibiotics for the treatment of endocarditis, pelvic inflammatory disease, and bacterial vaginosis. It is also effective against following infections: giardiasis, dracunculiasis, amebiasis and trichomoniasis. 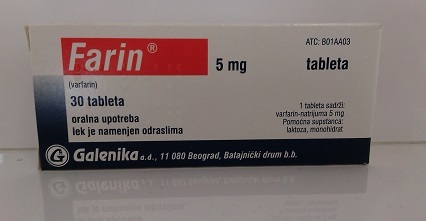 It is first drug of choice for the beginning episode of Clostridium difficile colitis. Flagyl is available in the form of: capsule in doses of 375 and 500mg, film-coated tablet in doses of 250 and 500mg, 10% cream and suppository of 500mg. Other brand names for metronidazole products on the market are: Arilin, Anabact, Efloran, Entizol, Metrotop, Novonidazol, Orvagil, Protostat, Trichazole, Trichopol and Vertisal. How does Flagyl work in the body? Metronidazole is a prodrug, compound that is after administration converted within the body (metabolized) into a pharmacologically active form of drug. Unionized form molecule is highly selective for anaerobic bacteria cell because of ability to intracellularly reduce metronidazole to its active form. This reduced metronidazole covalently binds to DNA molecule, and works by disrupting DNA helical structure, inhibiting synthesis of bacterial nucleic acid and which results in bacterial cell death. Can patients take Coumadin and Flagyl together? If patients are currently being treated with Coumadin, they should let their doctor know before they are start taking Flagyl because there is a high risk of potential serious side effects to happen. Flagyl may increase levels of Coumadin in blood by slowing drug metabolism of Coumadin. Delayed metabolism of Coumadin can enhance the anticoagulant effect and increases the chance of bleeding complications. The available evidence suggests that Flagyl can inhibit CYP2C9, the enzyme responsible for Coumadin metabolism. Prothrombin time and/or INR should be monitored closely while using these drugs. Patients should be advised to contact their doctor if they develop signs and symptoms of excessive anticoagulation, such as: bruising, vomiting, unusual or prolonged bleeding, headache, dizziness, change in stool or urine color, or weakness. The table below shows the incidence of side effects after Coumadin and Flagyl administration in recommendable doses. The incidence can be increased if these drugs are taken together or overdosed. Patients should tell their doctor and pharmacist if they are allergic to Coumadine or Flagyl, or any other medications, or any of the ingredients in their product forms. Patients should tell their doctor and pharmacist what prescription and nonprescription medicines, nutritional supplements, vitamins and herbal preparations they are taking or plan to take. There are many drugs that have interaction with Coumadin and those interactions can cause serious side effects. Patients should tell their doctor and pharmacist if they have or have ever had diseases such as: diabetes; atherosclerosis, some liver or kidney disease; bleeding problems; porphyria, cardiovascular disease such as chest pain (angina), arrhythmias, high blood pressure or heart attack; an underactive adrenal or pituitary gland, or any condition that makes swallow difficult. Patients using Coumadin should tell their doctor and pharmacist what herbal or botanical products they are taking, especially if they are using coenzyme Q10 prparation, Echinacea, Ginkgo biloba, garlic, goldenseal, ginseng, and St. John’s wort. There are also many other herbal or botanical products which might affect body’s response to Coumadin. Patients should tell their doctor if they have or have ever had diabetes. Also they should tell their doctor if they have an infection, a gastrointestinal illness such as diarrhea, or sprue or an indwelling catheter. Patients should also tell their doctor if they are pregnant or plan to become pregnant or if they are breast-feeding. If they become pregnant while using these drugs they should call their doctor immediately. Pregnant women should not take warfarin unless they have a mechanical heart valve. Coumadin may harm the fetus. If patients should have surgery, including dental surgery, they should tell their doctor or dentist that they are using these drugs. Doctor may tell to stop taking warfarin before the surgery or procedure or change your dosage of warfarin before the surgery or procedure. Patients should tell their doctor if they have or have ever had blood, kidney, or liver disease or Crohn’s disease. Patients using Flagyl should not drink alcohol while taking this drug. Alcohol may cause an upset vomiting, stomach cramps, stomach, headaches, sweating, and rednes of the face. Metronidazole may make skin sensitive to sunlight. Studies have found that metronidazole can cause cancer in laboratory animals. Patients should talk to their doctor about the risks and benefits of using this medicine.